Quan Lavender has recently re-opened her LTD Gallery Shop (connected to Love to Decorate Magazine), and it features works for sale by a wide variety of artists, including a special piece by claudia222 Jewell, who has been largely quiet as a creator since the closure of spirit at the old Art Screamer sim. Even if you're not planning on a purchase, you might take an interest in window shopping these two- and three-dimensional artworks by Apple Fall, bf2 Sheperd, Dan Freeland, Fae Varriale, Feathers Boa, Fuschia Nightfire, Gavie Garzo, Gouda Latte, Isabeau Baragula, Lilanna Clarity, Louly Loon, Masako, Ragamuffin Kips, Rod North and Trill Zapatero. 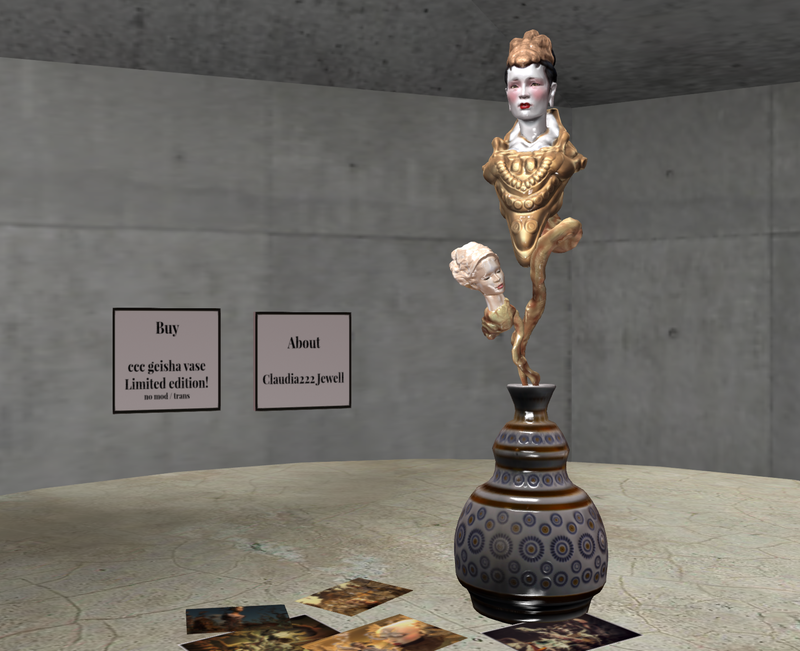 claudia222's work is a limited edition "geisha vase" (image below). Originally only 50 of these were available, but I can safely say the number has dropped to 49 or lower.